ClockworkMod , or abbreviated as CWM is a custom recovery tool for Rooted Android phones , tablets and other devices . ClockworkMod was developed by Koushik Dutta . Recoveries like CWM are required to carry out several advanced operations like recovery , restoration , installation and maintenance on your Android phone . The most popular use of ClockworkMod is to install a Custom official or unofficial OS on any Rooted Android phone , also including which cannot be done with the stock Android recovery . A custom Android recovery basically replaces the stock recovery with one that lets you do all you can do with the stock recovery, plus a plethora of more options to give you a lot more control on your device. With a custom recovery, you can install official and unofficial ROMs as well as other updates including apps, themes, kernels etc. using zip files, wipe not just user data but pretty much every partition on your device, mount the storage card for USB mass storage access without leaving recovery, partition your SD card, wipe Dalvik cache and battery stats, fix permissions, perform, manage and restore backups and so on. While there might be many other recoveries Out there , ClockworkMod stands out because of its easy to use UI and design . The first method would require you to use a PC and flash the ClockworkMod file on your phone with the help of Odin . If you are a new Android user then you might want to skip this process and proceed with the second method , which is fairly very easy to use and even hassle free . In this Guide , we will follow the second method to install Clockworkmod , which is easier and you don’t have to waste your time searching for the latest Clockworkmod recovery on the internet . 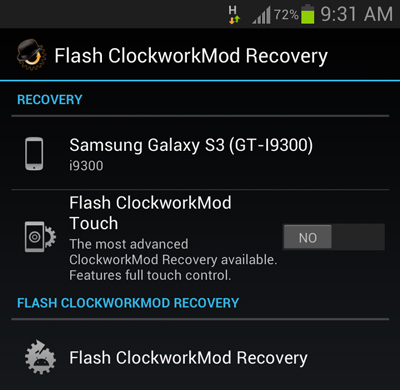 Note : In order to use ClockWorkMod recovery you need a rooted android phone , tablet or any other device . You can either use Odin to Root your Android phone or use Framaroot to Root your phone without the need of a PC . 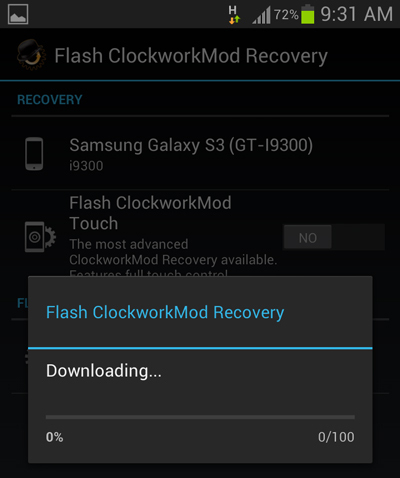 Once you get your Android phone rooted you can proceed further to Install ClockWorkMod Recovery on your Android Phone . To install the Clockworkmod on your android phone without the need of a PC , you can use the Rom manager app ( Developed by Koushik again ) . Download the ROM manager app from the link given below . You don’t need to download the Clockworkmod recovery as the ROM manager app can download the specific Clockworkmod recovery according to your Android phones make and model . Method 2: Installing Clockworkmod using Rom manager . Step 1: Install ROM Manager on your Android device and Run it . 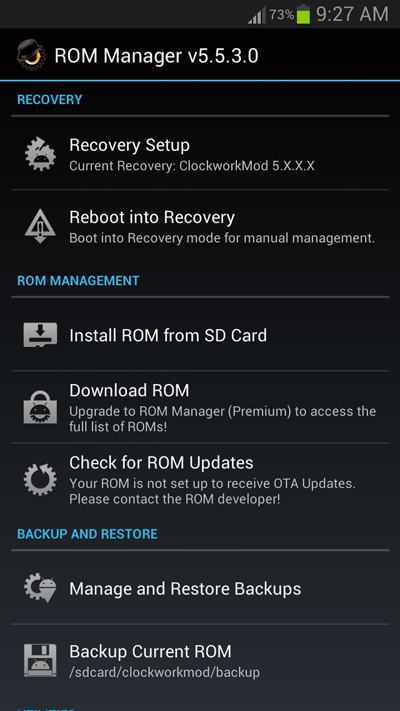 Step 2: Select Recovery setup from the ROM manager app . Step 3: Under Install or update recovery , tap on ClockworkMod recovery . Step 4: Wait a few seconds for the app to identify your Phone’s make and model . If the app correctly displays your phone’s model then tap on it . Although the phone will recommend you to connect to a WiFi network , a 3G data connection works perfectly , as the Clockworkmod recovery is around 7 to 8 MB is size for all Android Phones . Click ok to everything to proceed further . Step 5: Tap on Flash ClockworkMod Recovery . The app will now begin to download the Clockworkmod recovery . Wait for a few seconds until the download completes . After the ClockworkMod recovery is downloaded , the app will automatically install it on your phone . Step 6: To check if the ClockworkMod recovery is installed on your phone , return to Rom Manager’s home menu and tap on Reboot into Recovery . Your phone will now reboot and enter the ClockworkMod recovery . That’s it , now your Android phone has been successfully flashed with the latest ClockworkMod recovery . go ahead and install a custom Android ROM and enjoy your phone .